Michele Zack again delivers urban history at its best. As with Altadena, she pays her subject the tribute of extensive research and lively narrative. Whether it be people, politics, water, the environment, or social and racial issues, Zack places Sierra Madre’s story in a regional and national context—so that this history encompasses the range and richness of Southern California for those seeking a better life. Here is a regional history that offers us real insight into American life." "Magnificently illustrated with photographs, maps, and works of art, this book will please all who love Southern California and its environment. 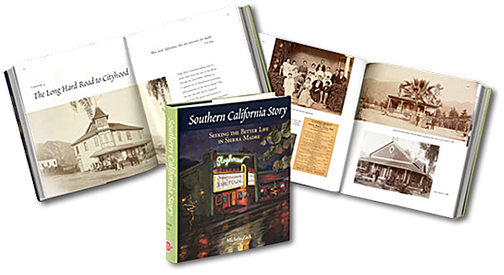 Michele Zack, local historian, fills her history of Sierra Madre with fascinating information while also showing how it relates to larger historical developments." Daniel Walker Howe, 2008 Pulitzer Prize-winning author of What Hath God Wrought: The Transformation of America, 1815-1848.